When you are faced with the problem of calling EJBs from another language, you —like most people— will probably think web services. After all, most modern application servers come with a built-in web services stack that's just waiting to be used. Why do we propose a different solution? Well, for one thing we like to sell our product, but a JunC++ion-based solution truly has many very attractive technical characteristics which we would like to point out to you. EJB and C++ can work very well with each other if you allow JunC++ion to be the middleman. Please also check out the corresponding .NET example which is based on JunC++ion's .NET sister tool called JuggerNET. 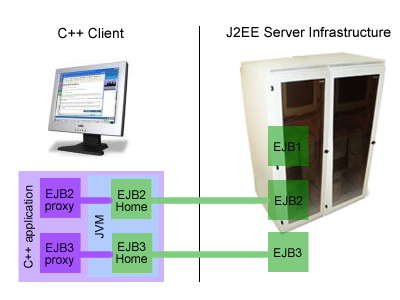 As the image on the right shows, you have your regular J2EE server infrastructure on the server side. You do not need to make any deployment or configuration changes to enable the C++ client use case from the server's perspective. On the client side, you obviously have the C++ application that wishes to communicate with the J2EE server. Inside the application, you have generated proxy types for the EJB home interfaces and any other Java types that you wish to use. The C++ developer wrote code directly against these generated bindings, almost as if the J2EE server were really publishing a C++ based infrastructure rather than a Java infrastructure. Under the hood, completely hidden from the C++ developer, the proxy types and the Codemesh runtime load a JVM into the C++ process and delegate (purple connectors) to the underlying Java objects, in this case the Java client-side bindings for the Enterprise Java Beans. These Java objects handle the communication with the server (green connectors). What's so remarkable about this picture? The server is totally unaware that there is a C++ client. As far as it is concerned, it is communicating with a Java client, which happens to be "hosted" by a C++ application. Assuming you have Java clients for your server, you have to make absolutely no changes to your deployment. There are no security-related changes, no transactionalization-related changes, no firewall-related changes, no deployment-descriptor changes. JunC++ion users with this use case have found out through benchmarks on real applications and real application servers that this solution has much better performance than web services-based integration. Not only is there less overhead on the client side, but the server apparently scales better too when tested under load. As part of your EJB deployment, your application server's deployment tool will typically offer to create a client deployment jarfile for you. You import this jar file (in a pinch you could also use the server-side jar) into the code generator and generate C++ proxy types for all Java types that you wish to use from within your C++ application. In the above picture, the developer decided not to generate proxies for EJB1, presumably because the C++ application does not need to use that particular EJB. As already mentioned, your Java server does not require any changes at all. Your C++ application will require the Codemesh runtime library to be present and it will require a Java Runtime Environment (JRE). You can bundle a so-called "private" JRE with your a pplication, or you can rely on the presence of a JRE on the client host. The latter alternative might be perfectly acceptable in well-controlled intranet deployment scenarios. There are no configuration changes required to accommodate the client/server communications (assuming you already have things set up for Java client/Java server communications). It sounds strange to use in-process integration for such an explicitly client/server use case, but it has some huge advantages when compared with competing integration approaches. It has better performance, better security, easier deployment, and great maintainability. All of these factors combine for an excellent cost/benefit picture.